Megan Bradley, aged 22, from Malvern has been selected to represent Friends of the Elderly at the 2018 London Marathon. Megan will be hosting several events at home in Malvern in the run up to the Marathon to support her fundraising efforts. Megan will be hosting an evening of music at The Great Malvern Hotel. The evening will see a handful of local acts perform, as well as staging an Irish Raffle in the break. There is no door charge for this event but donations are welcome. Megan will be performing herself, alongside headline act Kitchen Island Band, female duo Cory’s Angels, and local musician Nick Medakovic. Megan and her mother, Shirley, will be hosting a coffee morning at Triangle Day Care Malvern. This service is managed by Shirley and is part of the Friends of the Elderly group. It was Shirley and her time with Friends of the Elderly that inspired Megan to take on this challenge to support older people. A fun quiz evening at the Great Malvern Hotel will be hosted by BBC Hereford and Worcester presenter and local, Dave Bradley. The evening will mark the final week before London Marathon 2018 and will be the last time Megan is in Malvern before the race, offering a great opportunity for any final donations. There is a charge of £5 per person to enter, maximum of six people per team and there will be lots of prizes to win on the night. To book your place, please email shirleybradley@sky.com. 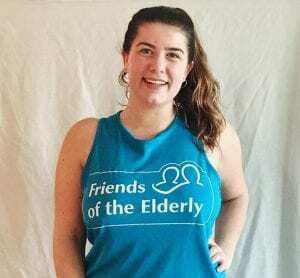 Money raised by Megan’s marathon fundraising will go toward the work of Friends of the Elderly, a long standing charity supporting older people. Friends of the Elderly supports people to live well, through the charity’s care homes, community services, befriending programmes, grants and special projects like Football Friends. Working with partners, the organisation also endeavours to raise awareness about the issues that affect us all as we get older. In Malvern, Friends of the Elderly operates three care homes and, through its sister charity Triangle Community Services, home care and day care.